What attracts photographers working in the genre of street photography? Fixing a moment that will never happen again, ancient buildings and fashionable skyscrapers, smiles of random strangers and pensive silhouettes lost somewhere at the end of the street. It is necessary to correctly edit photo in order to emphasize all the details and convey the idea. Our street photography Lightroom presets can help you with this. Beautiful but sometimes gray landscapes of the city and the US street photographers inspired our photo retouching company to create a LR filter pack that will help turn your street photography into a masterpiece. 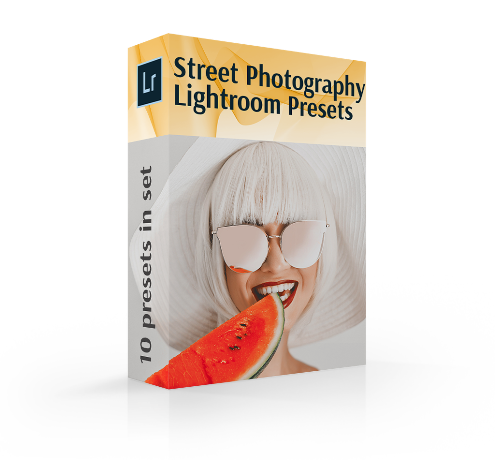 These street photography Lightroom presets add color saturation, different shades and subtle mattes to your photo so you can set the correct color settings for them. This package you can use for a day and night photography. Your day photos will receive eerie glow and desaturated colors. Night images will acquire color in the shadows and a little bit of vibrance, which slightly transforms the usual boring landscape. LR Preset #1 "Golden Hour"
LR Preset #6 "Soft Contrast"
LR Preset #10 "Warm Effect"
The objects of street photos are mostly people in public places. City street photography can be described as a genre of digital art in where there is no posing. Contemporary street photographers should edit the photos carefully not to spoil all the magic of it with unnecessary Photoshop or LR effects. For this, we recommend using street photography Lightroom presets that have been developed by our professionals, taking into account all the characteristics of street photography.This photo genre is not limited to photographing the plot with a set of variables such as geometric, contrast, color or semantic rhythm. Sometimes the photographer should pay attention to the hands, faces, cloths or a lonely standing object. With our free Lightroom presets, you can easily visually emphasize any details, increase contrast and brightness and street photography post processing will become easier. Try black-and-white or monochrome urban photography presets, thanks to which the photos convey human emotions better, caught in some decisive, interesting moment. When you edit street images, you should pay attention to the background and lighting. Our plugins will be able to add extra expressiveness and attractiveness to your photos by correctly tuning these indicators. Street Photography Lr Preset #1 "Golden Hour"
After applying this filter, your photo will acquire soft colors and low contrast. For portraits and studio photos this effect is suitable. You can also correct city and landscape photos with this plugin. Lr Preset Street Photography #2 "Matte"
Make your images look like frames from an old Polaroid. This is very interesting effect, which is realized by the channel work with curves and color. In this plugin the point of black is strongly raised, because of what the photo looks as though a tight little haze. This is one of the best inspired eye presets. Street Photography Preset Lightroom #3 "Vintage"
The effect of this plugins created by adding noise to the photo and a certain change in the color gamut, which has a significant effect on the overall appearance of the photo in turn and the effect of the frame shot on the old film appears. Also you can try our free vintage Lightroom presets for retouching pictures of this genre. Free Street Photography Lr Preset #4 "Orange&Teal"
This filter is great for bad photo session conditions and produces very bright and juicy colors. Overexposure increases the contrast and leaves the image in a pink tint, and underexposure gives the photos a strong fade. Lr Street Photography Preset #5 "Forest"
It is a fine filter for night photos, where the photo goes into blue tones with underexposure, and when overexposure gives a better saturation and natural shades of the skin. The plugin adds deep saturated colors to the picture. Street Lightroom Preset Free #6 "Soft Contrast"
Low-contrast LR fiter with soft tones is best suited for street portraits surrounded by natural colors. Beautiful desaturated portrait look preset is fine with not only portraits, it will also look great on any photo without overflow of sunlight. Plugin fit colorfully for any night photography, add a toning effect and raise the overall contrast of the photo. Lr Preset for Street Photography #7 "POP"
High contrast, the predominance of red hue in overexposure, saturated colors, all that gives urban photography preset. Portraits, fashion photo session, wedding photography are its elements. Adobe Lightroom Street Preset #8 "Film"
A beautiful plugin creates a film effect on your picture. This array of settings can become indispensable in the arsenal of a landscape or just a beginning photographer. The uniqueness of the plugin is that it does not create noise and strong contrast during photo post processing. Street Lightroom Preset #9 "Rainbow"
This preset was taken from "Wedding Classic"
Beautiful, colorful and contrast preset Lightroom street edits your photo, adding contrast and saturated light to it. This effect is loved by photographers for the unique transfer of colors and shades of skin. Coupled with a soft contrast and a slight graininess, it is ideal for portraits. Lightroom Preset Street #10 "Warm Effect"
One of the simplest free Lightroom preset, which is based on simple color correction to warmer ones. This plugin does not make significant changes and does not change the color tone, so this LR filter is especially recommended by developers for those who don’t know where to start. It is one of the most used one, with pleasant colors and a natural shade of skin, which makes it a good choice for wedding or fashion photography. This effects pack was performed by our professional street photographers with attention to every detail. They were created in order to help the photographer emphasize unnoticed details of the street and make a photo less ordinary. In connection with the variety of free Lightroom presets for street photography you can use them absolutely for different types of photos. Applying free Lightroom presets for street photography, you will see that nothing is distracting attention from the main subject.